Xtreme 9000 Finishes is a small mom & pop operation. Since we don't have high overhead, or a multi-million dollar race car to support, we can focus our time and energy in creatiing a outstanding product for you. We travel around the country meeting new customers and fulfilling orders from our online store. We sell the highest quality auto paint in the industry at the lowest possible price. 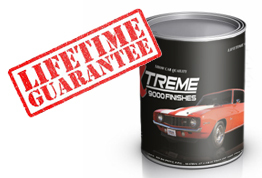 We carry our own Xtreme 9000 Finishes brand with a Lifetime Product Guarantee exclusively. Customer Service is our number one goal with your Satisfaction 100% Guaranteed.